This cucumber salad gets its name from the apple cider vinegar. It lends a sweet and sour tang to this dish that reminds me of fresh pickles. 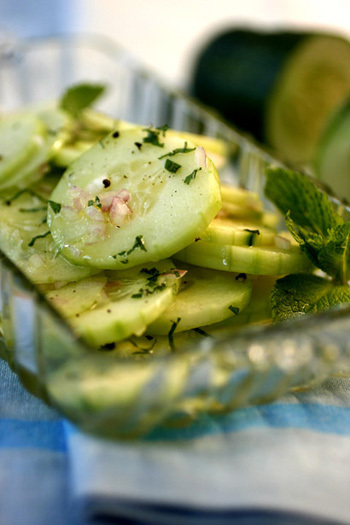 Cucumber salad also makes a great topping for your turkey burger or salmon cakes in place of pickle relish. Spread cucumbers out in a colander, sprinkle with salt and rest for 20 to 25 minutes. Squeeze cucumbers gently to remove any excess water and place on paper towel. In a large bowl, toss cucumbers with shallot, vinegar, olive oil and mint or basil. Serve immediately. Nutritional Stats Per Serving (1 cup with sugar): 96 calories, 1g protein, 7g carbohydrates, 7g fat (0 g saturated), 0mg cholesterol, 1 g fiber,167 mg sodium.